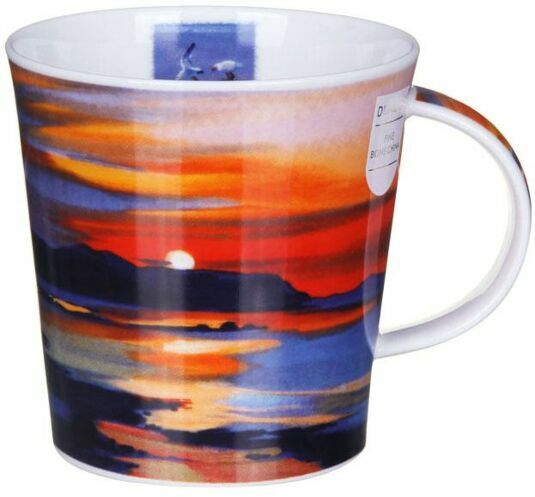 Sunset in the Scottish Isles is the theme of the image on this mug from Dunoon. The sky is a blend of orange and yellow, streaked with the purple of dusk, and in the distance the sun sets behind an outline of dark hills. The glorious colours of the sky are reflected in the water, creating an almost abstract blend of oranges, blues and purples. This mug celebrates the lonely beauty of the Scottish landscape and its wilder outposts. Pam Carter studied at Glasgow School of Art and lectured for many years as well as exhibiting her work. She has been a full-time painter since 2003. Pam is inspired by the Scottish landscape and seascape, focusing on contours, light and dramatic viewpoints. The 'Cairngorm' shape, named after the eponymous Scottish Mountains, is a larger version of the Lomond shape mugs. It has a gentle slope to the body and a curved handle. 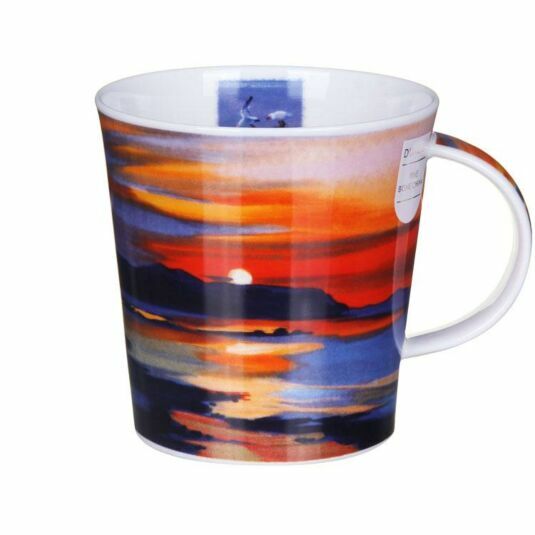 With a range of fabulous designs to choose from this 'oversized' mug is a must. With a capacity of 480ml they are both dishwasher and microwave safe, with the exception of any mugs with gold embellishment.